Background: The Valley of Mexico is an interior basin about 9000 square km in area. The basin floor sits at an elevation of 2200 meters above sea level and is surrounded by mountains that rise up to more than 5000 meters above sea level. It receives around 700 mm of rainfall a year, with a rainy season from late May to September. 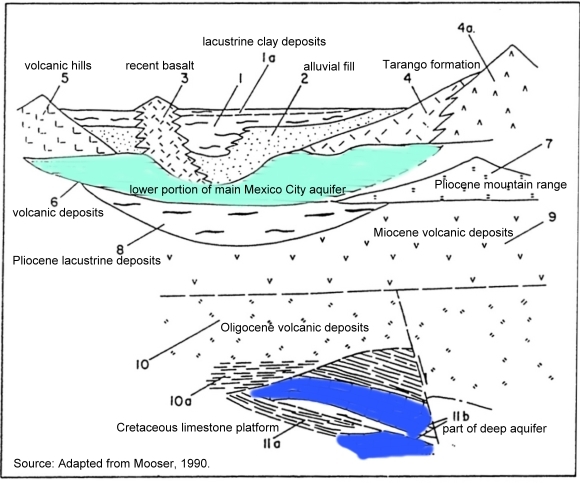 The basin was originally the site of several lakes and marshes, and much of it is underlain by lacustrine sediments up to 100 m thick, beneath which are alluvial sediments up to 500 m thick (see geological cross-section below). These sediments are interstratified with layers of volcanic basalt. Beneath the alluvial sediments are 100 m to 600 m of volcanic deposits, which form the principal Mexico City aquifer (found about 500 m to 1000 m below Mexico City). The National Water Commission (CNA) and Mexico City Water System (SACM) are undertaking a 3-year, 23-million-dollar feasibility study to assess the potential of an aquifer that lies more than 2000 meters below Mexico City. (Our earlier, initial report about this aquifer is here). The project includes experts from Pemex, CFE and UNAM’s Institute of Geophysics. Initial exploratory wells have shown that the deep aquifer’s water quality is superior to that currently derived from the overexploited shallower wells that extend to depths of around 800m. It is hoped that the feasibility study will confirm that water from the deep aquifer could be an additional viable source of freshwater for the city. Assuming the deep aquifer is hydrologically independent of the shallower aquifers, this would not only reduce the need to pump water from the shallower aquifers, but would also avoid the ground subsidence resulting from continued shallow-water extraction. The feasibility study will assess whether or not the deep water aquifer is “fossil” water or is still being recharged from precipitation and underground throughflow. If it is being recharged, the experts will calculate its recharge rate to determine the aquifer’s maximum sustainable yield. (The maximum sustainable yield is the “additional groundwater output from the system which will cause minimal and acceptable levels of stress to the ecosystem with maximum benefits to the society and to the economy”). The first test well is likely to be sunk in the Magdalena Mixhuca Sports City area, in the eastern part of Mexico City. This potential deep aquifer source of freshwater could play a vital part in ensuring that future generations of Mexico City residents have a dependable and sustainable water supply. Mexico’s consideration of utilizing deep water aquifers runs counter to the prevailing wisdom in the US where it has long been argued that deep water aquifers will be too costly to utilize for fresh water, will never be used, and are therefore more useful as a repository for waste and can be intentionally polluted. Mooser, F. 1990. “Estratigrafía y estructura del Valle de México en el subseulo de la cuenca del Valle de México y su relacíon con la Ingeniería de cimentaciones, a cinco anos del sismo”, in Revista de la Sociedad Mexicana de Mecánica de Suelos. Mexico, D.F.